Are you in need of pest control services in Sudbury? Well look no further than Big Blue Bug Solutions! Our locally owned and operated MA pest control company has been proudly serving home and business owners in New England with the most complete residential and commercial pest control services since 1935. 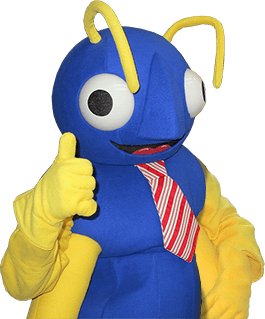 With our well known mascot, Nibbles Woodaway (the big blue bug), we have been trusted with eliminating problem insects and rodents from Sudbury homes and businesses and making sure they do not return. Whether you are dealing with annoying spiders building webs in your home or a severe mouse infestation in your business’ kitchen, you can count on our Sudbury exterminators to resolve all your pest problems. No one wants to deal with the problems pests pose in their Sudbury home. Our professional exterminators at Big Blue Bug Solutions would like to offer some helpful tips on how to prevent pests from entering your home. Note: These pest-proofing tips are most effective in conjunction with our year round home pest control program. Install heavy duty weather stripping on all exterior doors. Regularly clean your kitchen, remembering to thoroughly clean beneath appliances and in cupboards. Keep outdoor trash cans securely sealed, using bungee cords if necessary. Inspect the exterior of your home, sealing any holes, gaps, and cracks along your foundation and around windows, doors, piping, wires, and exhaust vents. Keep trees and shrubs trimmed back away from the side of your home. Install screens on exterior vents and install a chimney cap if you have a fireplace. Store firewood away from the side of your home, remembering to carefully inspect it for spiders and other insects before you bring it indoors. Repair any leaky faucets and pipes on the exterior and interior of the home. By using these simple and easy pest prevention tips, you will better protect your home from troublesome and annoying pests. If you have seen ants marching along your countertops or have found cockroaches scurrying across your bathroom floor, contact Big Blue Bug Solutions and let our Sudbury exterminators eliminate all your pest problems once and for all! For over 80 years, Big Blue Bug Solutions has been offering the most complete commercial pest control in Sudbury MA. Our commercial pest control services are specifically designed to fit your business, making sure it remains pest free by preventing pest infestations before they strike. We understand just how troublesome and damaging pests can be to your business which is why we want to stop them before they have the chance to infest. If you suspect that you may have a pest problem in your business, contact Big Blue Bug Solutions and let us protect your brand, image, and reputation from troublesome pests today! If you live or work in the Sudbury area and are in need of a New England pest control you can trust in, look no further than Big Blue Bug Solutions.